Like many basket quilt blocks, the arrangement of the patches in Christmas Basket is set on point. 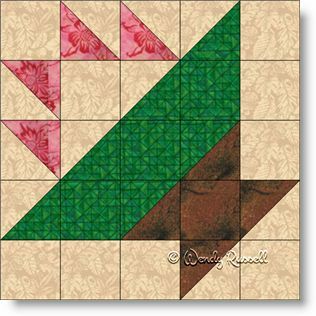 This gives you the opportunity to have great fun playing around with layouts when it comes to designing your personal quilt. The blocks are easy to construct as they are composed of only the simplest of patches -- the square and the half square triangle. Rotating these five patch quilt blocks by 90 degrees (or more) will often create a secondary pattern, as is illustrated in both of the quilts shown. One of these quilt samples was laid out with blocks side by side, while the other is set on point with lots of opportunity to show off your quilting skills in the blank triangle pieces on the outside. There is no limit to the designs you can come up with. Enjoy!